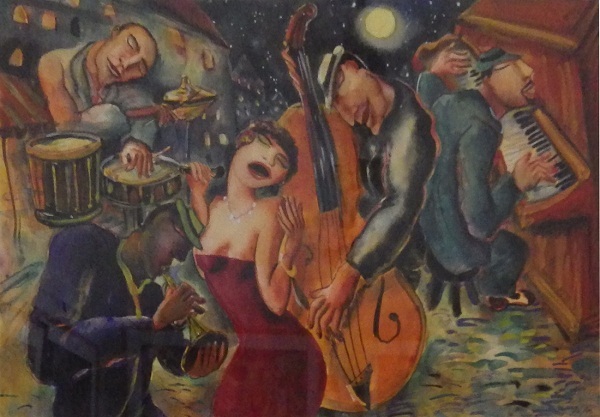 Luis Castellanos Valui, born in Guadalajara in 1955, is a painter who infuses his Latin American roots with the traditions of tropical jazz and cafe culture. He studied for two years at the Fine Arts University in Guadalajara. At the age of 20 he moved to Mexico City where he studied at the “Esmeralda” school. He restored Colonial and Pre-Hispanic art for 4 years at the request of the Mexican government. He then established himself in the Bohemian community of Tepoztlan, Morelos, a small village south of Mexico City. There he began his formal career as a painter. In 1986, he had his first individual exhibition at the prestigious OMR Gallery in Mexico City. Since then he has exhibited in collective and individual shows in the Modern Art Museum in Mexico City, the Modern Art Museum in Monterrey, Chac Mool Gallery in Los Angeles, living in different parts of Mexico and abroad. He has done shows from California to New York, Mexico City to Paris, Islas Mujeres to Vallarta, and back again. Luis paints in oil, as well as water color. When you attend his shows, you will hear the friendly bantering of his collectors: “Well I own 7 of his paintings”. Another will say “But I own 11”. Very few people stop at purchasing only one painting by Luis. The paintings make you smile and leave you with a warm, fuzzy feeling inside. 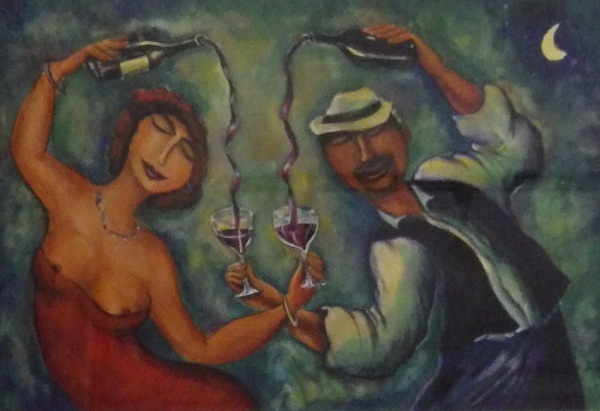 Luis is a painter of our senses, what you feel looking at his paintings: to dance, to sing, to dream, to love. And when it comes to dance, there is probably not a style that Luis has not painted: mambo, tango, salsa, cha-cha-cha, waltz. There are scenes on the beach, by the campfire, in plazas, street and market scenes. His paintings are fresh, luminous and definitely tropical. They are full of humor and saturated with color and light. Collected by the J. Paul Getty Institute and Capitol Records, Valui creates rhythmic images, bringing his subjects to life. His works are also in the collection of Atlas and Mambo Restaurants, Go West Productions, Televisa, Ripstein Collection, Univision. At his openings in Los Angeles, many Hollywood jet setters are among the collectors. Luis has started a new chapter in his life. He is in love and it shows in his works! They are happy and in his opinion and ours, “his best works to date”. Thank you Luis for bringing us such joy.